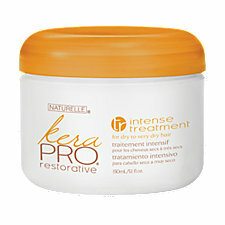 KeraPRO Restorative Treatment is an intense nourishing treatment saturates hair from roots to ends for the ultimate restorative therapy for extra dry or stressed hair. Contains scientifically-advanced glucose, lipid and keratin protein actives. Locks nutrients deep inside the hair fiber leaving hair soft, shiny and healthy. Use with KeraPRO Shampoo. Apply to clean hair and massage through the lengths and ends. Leave for 5 minutes. Rinse well. This is another half price purchase from Sally’s; they do these sales often so I always look out for them lol. I started this review over two weeks ago but got side tracked when I checked the website and saw that this was on sale again, so you know your girl stocked up! So amazing is this product I had to give it its own space! I did a review on the shampoo and elixir here. I love this deep conditioner, it leaves my hair sooooo soft and moisturized for days. It literally melts in my hair. My hair does feel stronger after using this conditioner, proteins are high on the list of ingredients but I never get that stiff feeling. I used this a lot when I first started my hair journey and my first stretch was effortless, new growth at 17 weeks post was extremely manageable, so much so I remember I didn’t even feel ready to touch up. This is one of my staples despite the fact that I only get two uses per tub. This product does what it claims; I only wish I could get it locally at a reasonable price. Will I purchase this again? Of course!!! Would I recommend this? Absolutely!!! Thanks for this review. I recently purchased this but haven't used it yet but I think I'm gonna try it out this weekend. Hopefully I'll have the same great results. That is one of my favorite conditioners. I just wish it came in a bigger container. I'm protein sensitive but my hair loves that one. My stash of it is running low. It's time for me to stock up again myself. This is another deep conditioner I have been wanting to try. I think I will wait for it to go bk on sale then I will purchase. It was still on sale up to yesterday, I bought some more lol get some!